This article is about the type of truck. For other uses, see Monster Truck (disambiguation). A monster truck is a specialized truck with a heavy duty suspension, four-wheel steering, and oversized tires constructed for competition and entertainment uses. Originally created by modifying stock pickup trucks and sport utility vehicles (SUVs), they have evolved into purpose-built vehicles with tube-frame chassis and fiberglass bodies rather than metal. A competition monster truck is typically 12 feet (3.7 m) tall, and equipped with 66-inch (1.7 m) off-road tires. Monster trucks developed in the late 1970s and came into the public eye in the early 1980s as side acts at popular motocross, tractor pulling, and mud bogging events, where they were used in car-crushing demonstrations. Today they are usually the main attraction with motocross, mud bogging, ATV racing, or demolition derbies as supporting events. Monster truck shows typically have two main events, a race and a freestyle competition. Races are conducted as a single-elimination tournament on short, symmetrical tracks, which may include obstacles such as junk cars or dirt mounds. The length and complexity of the track can vary with the size of the venue, with courses in indoor arenas typically being shorter with fewer obstacles. In freestyle events, each driver puts on a performance consisting of stunts such as obstacle jumps, backflips, wheelies, and doughnuts. A panel of judges assign points to each performance and the driver with the most points is declared the winner. Historically, additional vehicles for the drivers to crush, such as motor homes and school buses, were placed on the track specifically for the freestyle event. However, incidences of debris flying into the stands and causing serious injuries have influenced most event promoters to turn away from such obstacles. Most freestyle courses now consist mostly of large mounds and ramps erected to allow the trucks to perform large jumps and wheelies upon landing. Freestyle performances have a set time limit and only one truck is allowed on the track at a time as a safety measure. Freestyle events are typically the final competition of a show, as damage to the trucks would make them unable to race. In the late 1970s, heavily modified pickup trucks were becoming popular and the sports of mud bogging and truck pulling were gaining in popularity. Several truck owners had created lifted trucks to compete in such events, and soon competition to hold the title of "biggest truck" developed. The trucks which garnered the most national attention were Bob Chandler's Bigfoot, Everett Jasmer's USA-1, Fred Shafer and Jack Willman Sr.'s Bear Foot, and Jeff Dane's King Kong. At the time, the largest tires the trucks were running were 48 inches (1.2 m) in diameter. In April 1981, Bob Chandler drove over junked cars in Bigfoot in what is often believed to be the first monster truck to crush cars. Chandler drove Bigfoot over a pair of cars in a field as a test of the truck's ability, and filmed it to use as a promotional tool in his four-wheel drive performance shop. An event promoter saw the video of the car crush and asked Chandler to do it in front of a crowd. Initially hesitant because of the "destructive" image that could be associated with Bigfoot, Chandler eventually agreed. After some smaller shows, Chandler performed the feat in the Pontiac Silverdome in 1982. At this show, Chandler also debuted a new version of Bigfoot with 66-inch tires. At a prior event in the early 1980s, when Bigfoot was still running 48-inch tires, Bob George, one of the owners of a motorsport promotion company named Truck-a-rama – later known as the United States Hot Rod Association (USHRA) – is said to have coined the phrase "monster truck" when referring to Bigfoot. The term "monster truck" became the generic name for all trucks with oversized tires. King Kong and Bear Foot each followed Bigfoot to 66-inch-diameter (1.7 m) tires, and soon other monster trucks, such as King Krunch, Maddog, and Virginia Giant were being constructed. These early trucks were built off of stock chassis which were heavily reinforced, used leaf spring suspension, a stock body, and heavy axles from military-specification vehicles to support the tires. For most of the early 1980s, monster trucks performed primarily exhibitions as a side show to truck pulling or mud bogging events. In August 1983, Bigfoot and USA-1 competed in the first side-by-side monster truck race, which was filmed for the television show That's Incredible. By 1985 major promoters, such as the USHRA and TNT Motorsports, were racing monster trucks on a regular basis. In 1988, TNT Motorsports created a series to establish the first national championship of monster truck racing; USA-1 and rookie driver Rod Litzau edged out Bigfoot, driven by Rich Hoosier, for the title. In 1988, to standardize rules for truck construction and safety, Bob Chandler, Braden, and George Carpenter formed the Monster Truck Racing Association (MTRA). The MTRA created standard safety rules to govern monster trucks. The organization still plays a major role in the sport's development in the USA and EU. With racing taking precedence, several teams began to think in new ways as to how the trucks could be built. Towards the end of 1988, Gary Cook and David Morris debuted Equalizer, a truck with a combination of coil springs and shock absorbers as the main source of suspension rather than the standard of leaf springs and shock absorbers. In 1989, Jack Willman Sr., now with his own truck, Taurus, debuted a new truck which used a solid axle suspension system made of parallel four-link suspensions and coilovers that together weighed in at close to 9,000 pounds (4,100 kg). However, the biggest innovation came from Chandler, also in 1989, when the CAD-designed Bigfoot #8 debuted featuring a full tubular chassis and a long-travel suspension system made of triangulated four-link suspensions, bump stops, limit straps, cantilevers, and shock absorbers charged with nitrogen gas. The truck revolutionized how monster trucks were built, and within a few years most top level teams built similar vehicles. In 1991, TNT was purchased by the USHRA and their points series were merged. The Special Events championship began to grow in popularity with teams as it had open qualifying spots which the invite-only USHRA championship did not have. The Special Events series lost its Pendaliner sponsorship in 1997. The short-lived ProMT series started in 2000. Even though racing was dominant as a competition, USHRA events began having freestyle exhibitions as early as 1993. These exhibitions were developed as drivers, notably Dennis Anderson of the extremely popular Grave Digger, began asking for time to come out and perform if they lost in early rounds of racing. Promoters began to notice the popularity of freestyle among fans, and in 2000 USHRA began holding freestyle as a judged competition at events, and now even awards a freestyle championship. The USHRA's Monster Jam series, now owned by Feld Entertainment, is currently the largest, touring through the United States, Canada and select regions of Europe. Other pro of monster truck events include the Toughest Monster Truck Tour, the Traxxas Moster Truck Tour, and Hot Wheels Monster Trucks Live. This image of Grave Digger, minus much of its body work, reveals how far removed monster truck designs are from the traditional trucks they somewhat resemble. The first monster trucks built were pickup trucks and SUVs that were modified with larger suspensions and larger tires. Today, trucks now have custom built tubular chassis, with four-link suspension to provide up to four feet of clearance, and they also now have fiberglass bodies that attach to the chassis separately and are designed to be easily removed and easily replaced when damaged. The use of fiberglass panel bodies has allowed monster truck owners to develop a wide variety of thematic concept trucks that scarcely resemble the modified stock trucks that became early monster trucks. Engines are now typically mounted behind the driver on most trucks and are typically supercharged, run on a methanol alcohol and corn-based oil fuel, and have displacement of up to 575 cubic inches (9.42 L). Axles are mostly taken from either heavy-duty military trucks or road vehicles such as school buses, and are modified to have a planetary gear reduction at the hub to help turn the tires. All trucks have hydraulic steering in both the front and the rear (four wheel steering), with the front wheels controlled by the steering wheel and the rear wheels by a toggle switch. The tires are typically "Terra" tires used on fertilizer spreaders, and are of size 66"×43"-25", that is, 66-inch diameter, 43-inch width, to fit 25-inch diameter rims (168×109-63 cm). Most trucks utilize a modified or custom-designed automatic transmission, such as a Turbo 400, Powerglide, Ford C6 transmission, or a Torque-flite 727. A limited number of trucks utilize a Lenco transmission, which traces its roots to drag racing. Most of the automatic transmissions are heavily modified with transbrakes, manual valve bodies, and heavy duty gear sets. Trucks running a Lenco use a centrifugal clutch as opposed to a torque converter, which are used in automatic transmissions. Lenco transmissions are usually found in two-speed or three speed configurations, and are commonly shifted using compressed carbon dioxide. The trucks have many safety features, several of which are required just to run in the indoor arenas that the trucks frequent. Trucks are equipped with three shut-off switches: the RII (Remote Ignition Interrupt), one within the driver's reach in the cab, and another at the rear of the truck so that all electrical power may be shut off in the event of a rollover. Many trucks are constructed with the driver sitting in the center of the cab for visibility. Most cabs are shielded with Lexan or comparable polycarbonate, which not only protects the driver from track debris, but also allows for increased visibility. Drivers are required to wear firesuits, safety harnesses, helmets, and head and neck restraints. Most moving parts on the truck are also shielded, and high pressure components have restraining straps, both in case of an explosion. Despite the tens of millions of spectators which have attended monster truck events over the past 40 years, there have been few accidents which have resulted in injuries or fatalities. On January 16, 2009, at a Monster Jam event in Tacoma, Washington 6-year-old Sebastian Hizzey was killed when struck by flying debris from the truck Natural High. On January 25, 2009, the monster truck Samson was involved in an accident in Madison, Wisconsin that caused the death of announcer George Eisenhart after he accidentally stepped in front of Samson while it was moving. On October 6, 2013, the monster truck Big Show plowed into a crowd of spectators in Chihuahua, Mexico, killing eight people, and injuring 79 of them. On September 29, 2014, a monster truck plowed into a crowd of spectators in Haaksbergen, Netherlands, killing three people. The world's biggest monster truck is Bigfoot 5, built in 1986, with tires that measure 10 feet (3.0 m). The world's longest monster truck is the Sin City Hustler, which measures 32 feet (9.8 m) long and was created by Brad and Jen Campbell in 2014. The fastest speed record for a monster truck was achieved in 2014 by Mark Hall in Raminator at a speed of 99.1 miles per hour (159.5 km/h). The longest ramp jump done by a monster truck was achieved in 2013 by Joey Sylvester in Bad Habit at a distance of 237.7 feet (72.5 m). The first monster truck backflip in a scored competition was achieved in 2010 by Cam McQueen in Nitro Circus. The first monster truck front flip in a scored competition was achieved in 2017 by Lee O'Donnell at Monster Jam World Finals. 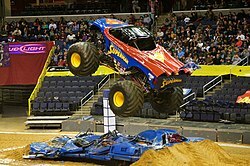 Wikimedia Commons has media related to Monster truck. ^ "Problems nearly sidelined monster truck prior to fatal accident". seattlepi.com. January 17, 2009. Retrieved August 8, 2011. ^ "Longest monster truck". Guinness World Records. Retrieved December 14, 2016. This page was last edited on 9 April 2019, at 10:06 (UTC).